2018-19 PANINI PRIZM FAST BREAK BASKETBALL. 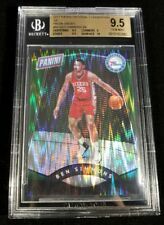 2018-19 Panini Prizm Basketball Zhaire Smith Silver Prizm Rookie Card 76ers RC. Condition is Brand New. Shipped with USPS First Class Package. Check out my other items! Examine photo for condition. Please add $3.99 for shipping. No international bidders. No combined shipping. For our protection, shipping process will be recorded. If winner does not pay after 1 week then order will be cancelled and buyer will be blocked and reported to eBay. Thank you and Good luck! LOT DOES CONTAIN DUPLICATES, SEE PICTURE FOR DETAILS! BEN SIMMONS 2016-17 DONRUSS OPTIC ROOKIE KINGS PRIZM REFRACTOR #2. Condition is Brand New. Shipped with USPS First Class Package. 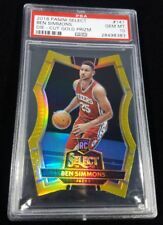 2017-18 Contenders Ben Simmons Ticket Premium PRIZM Rookie Year PSA GEM MINT 10. Condition is Brand New. Great Investment Card! Payment must be made within 2 days of auction's end. Paypal is the only acceptable form of payment. Cards will be securely packaged and shipped the following business day through USPS.By bidding on this item, you acknowledge this cards condition, it is the Card in the Photos, No Returns Accepted. 2 BOXES OF 2018-19 PANINI NATIONAL TREASURES BASKETBALL. - National Treasures is the only place to find Jumbo Rookie Patch Autographs! - One Base Or Parallel Card. Collect the only Jumbo Rookie Patch Autographs of the 2018-19 NBA release year! 2018-19 Panini Optic PREMIUM Rated Rookies - #'d/249 - Mint - Choose yours now! New Listing2018-19 Panini Prizm Fast Break Allen Iverson BLUE Disco Prizm #/175! New Listing2018-19 Panini Prizm Fast Break Robert Covington RED Disco Prizm #/125! 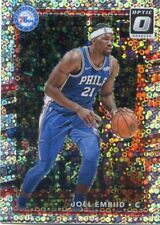 Up for auction is a..... 2018-19 Panini Prizm Fast Break Robert Covington RED disco prizm card. Card is short print #87/125!. Cards are taken from pack to toploader to prevent damage. Shipping is $3.50 for first card, and $.50 for each additional card. If you have any questions, please contact me. Thanks and happy bidding. You are looking at a 2016-17 Prizm Ben Simmons Starburst Prizm Rookie Card Insert. Sharp looking card! 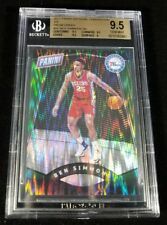 Card is in picture, 2017-18 Panini Prizm Ben Simmons Green Pulsar Refractor numbered 4/25 graded PSA 9 Mint. Shipping is FREE! ERIC SNOW 2018-19 PRIZM RED CHOICE AUTO SIXERS AUTOGRAPH. New Listing2018-19 Panini Prizm Fast Break JJ Redick BLUE Disco Prizm #/175! Up for auction is a..... 2018-19 Panini Prizm Fast Break JJ Redick BLUE disco prizm card. Card is short print #43/175!. Cards are taken from pack to toploader to prevent damage. Shipping is $3.50 for first card, and $.50 for each additional card. If you have any questions, please contact me. Thanks and happy bidding. Jimmy Butler 18-19 Panini Donruss Optic card #115 RETAIL PINK HYPER REFRACTOR parallel. I am not a professional grader, which means that there might be some flaws on this card. Maybe small scratches, dings, chipping etc. NM/MINT CONDITION. Brand new means it came out of a sealed pack/box. I do combine shipping costs, costs are determined by the total weight of items won/purchased. 23 Card Basketball Lot! Serial Numbered Autos Refractors. Condition is Like New. Shipped with USPS First Class Package. Markelle Fultz 2017-18 Panini Spectra Next Era Patch Gold Prizm Refractor 06/10. Condition is Brand New. Shipped with USPS First Class Package. 2018-19 Panini Prizm Fast Break Robert Covington RED Disco Prizm #/125! 2018-19 Panini Prizm Fast Break JJ Redick BLUE Disco Prizm #/175!